People who have experienced limb loss know that it only takes a moment for your life to be completely redefined. Yesterday, you were standing and walking. Today, you are in a hospital bed or a wheelchair. Tomorrow – well, tomorrow is uncertain and hard to even think about. Any amputation is life-altering, but people with bilateral above-knee amputations face a particularly complicated process of physical and emotional rehabilitation. The long-term goal is usually being able to walk again with prosthetic legs. However, even after months of rehabilitation, many people lose confidence that they will ever walk comfortably and independently. What can bilateral above-knee amputees do to increase the likelihood of getting their feet back on the ground? They can follow a graduated, four-step approach to becoming a prosthesis user. Step 1: Building confidence, conditioning and strength Step 2: Walking on short prosthetic legs with training feet Step 3: Gradually increasing height and eliminating wheelchair use Step 4: Walking on full-length prostheses with microprocessor-controlled knees, or computerized legs. This process has led to good outcomes for hundreds of bilateral amputees. Success depends on time, teamwork and transformation. Recovering from bilateral above-knee amputation takes a long time. People who have lost both legs are the survivors of a devastating traumatic injury, a life-threatening illness or a congenital limb difference. Some of these circumstances may require a lengthy physical and psychological recovery simply to regain strength and overall health. Also, for several months the residual limbs are in the early stages of healing and are not ready for the additional strain of wearing prostheses. This waiting time can be used to work on building upper-body strength, doing basic rehabilitative exercises with the guidance of a physical therapist, and talking about the emotions associated with the loss. During this period, simply hearing about the graduated approach to becoming a prosthetic user can lift your spirits and help you move forward. The length of time it takes to move from Step 1 through Step 4 depends on individual circumstances. The keys to Step 1, building confidence, conditioning and strength, are witnessing the firsthand success of a bilateral prosthetic user and ongoing support and encouragement from a peer. If you have tried to use bilateral prostheses and were overwhelmed by the increased energy expenditure and unsatisfactory results, consider the experiences of Heath Calhoun and Roland Paquette. Both are retired army staff sergeants wounded in the current conflicts in Iraq and Afghanistan. After 9 months of inpatient rehabilitation and prosthesis training, Heath spent 2 years trying to become comfortable using his prostheses. Ultimately, he decided that the difficulty of using prostheses outweighed the benefits and that he would need to rely on a wheelchair for mobility. That’s about the time Roland, a new amputee, met Heath. He had one question: Is it possible to walk on bilateral above-knee prostheses? Heath said “No.” In 2006, Heath, a full-time wheelchair user, attended a workshop for bilateral lowerextremity prosthesis users at the Amputee Coalition of America (Amputee Coalition) National Conference. He watched in amazement as trilateral prosthesis user Cameron Clapp walked across the room carrying a chair. “He walked like a person with two natural legs. No canes and no stumbling,” says Heath. Cameron had become a prosthesis user about 4 years earlier using the graduated approach. Heath instantly had new confidence that he too could become a full-time prosthesis user. Cameron provided Heath with the one thing he had never had: proof that success was possible. A year later, Roland saw a video that featured a bilateral above-knee prosthesis user walking unaided down hills and stairs, driving a manual transmission vehicle without hand controls, and golfing. The irony of the story? The prosthesis user was Heath. He became Roland’s peer inspiration. Heath and Roland’s story illustrates a critical point: What people believe about their ability to use prostheses successfully changes over time. The world of prosthetics is driven by new techniques and technologies. Staying open to new information and possibilities – even after being disappointed – is vital. At one point, Heath and Roland believed that life in a wheelchair was their best remaining option. Today, after completing the graduated approach, Heath and Roland are successful, highly functional, full-time prosthesis users. Teamwork Clearly, amputees who have recovered their mobility and independence have built a team of supporters. Who is going to be on your team? As described in Step 1, friendships with other bilateral prosthesis users are a necessity. Witnessing their success is what gives you the ability to pursue your success. It is unlikely that you will find another bilateral amputee in your own community. Therefore, you must network through your prosthetic provider and the Amputee Coalition. Another helpful option is a general amputee support group; most prosthetic clinics can connect you with a group in your area. Other key team members are your prosthetist, your physical or occupational therapist, your physician, your spouse or significant other, and your family and close friends. One of these people may be described as your personal advocate. Personal advocates invest untold hours helping you reach the best outcome possible for your situation. In some cases, amputees see that they must be their own advocate – the proactive person who seeks out needed information, while also creating a support team they can count on. With a solid team in place, you’re ready to move to Step 2, walking on short prosthetic legs with training feet. It has often been demonstrated that asking a bilateral above-knee amputee to go directly from a wheelchair to full-length prosthetic legs is not an effective approach. Instead, we believe in starting people on short prosthetic legs with customdesigned training feet. Short prostheses do not have a knee joint and are often referred to as “shorties” or “stubbies.” Short legs stabilize balance, reduce the risk of injury from falling, require less energy expenditure, and increase walking speed. They also build up the muscles in the hips and residual limbs, and are crucial to improving balance and burning calories to help reduce body weight. Short legs should include anatomically contoured prosthetic sockets that accommodate the bone, muscle, vascular and nerve structures of the residual limbs. Preferably, the sockets are direct-contact suction sockets. These sockets increase the person’s ability to control the prostheses when walking and enhance sensory feedback. Some people may need to wear gel liners to control swelling or to protect the skin. Susan Bailey, a 26-year-old mother of two, lost both legs after contracting E. coli bacteria and septic shock in 2007. She tried full-length legs, but relied on a wheelchair for true mobility. When Susan met Heath at the 2008 Amputee Coalition Conference, the power of peer-to-peer encouragement worked its magic. She decided to try short legs. Wearing them every day, she began to improve her physical condition and develop daily routines without a wheelchair. 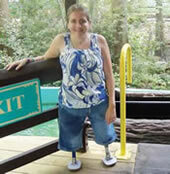 With short legs, Susan reentered the community, shopping and going out to eat. She could navigate obstacles such as curbs or inclines better, and if she did happen to fall, it was much less frightening. Learning how to fall and how to get up is another important aspect of Step 2. Susan welcomed each graduated increase in height that came with Step 3, gradually increasing height and eliminating wheelchair use. She spent about 6 months wearing short legs and rebuilding her confidence as a walker. During this time, her height was gradually increased by a total of about 15 inches, and she no longer used a wheelchair. Heath and Roland remained in contact with Susan, answering questions, providing helpful tips and cheering her forward. Susan’s limb loss and rehabilitation occurred along the same timeline as another woman’s, Hilary Everett, a 48-year-old teacher. Hilary lost both legs above the knee in a car accident and had spent 18 months recovering, then attempting to use full-length prostheses. Susan and Hilary offered peer support to one another by phone and e-mail, comparing notes on their respective height increases during Step 3. They met face-to-face at the Amputee Coalition Conference in Atlanta and continued to motivate each other as two women working to regain their independence and mobility. Susan and Hilary spurred each other on in a friendly competition over whose height increased the most rapidly. After several increases in height over a period of several months, both women “graduated” to wearing full-length computerized legs. A critical part of your rehabilitation depends on your commitment to the idea that a good outcome is possible – that over time, you can steadily transform your life. A significant part of your emotional transformation lies in facing the process of loss, grief, and, ultimately, acceptance of your new body image and lifestyle. The grieving process stages do not represent a specific way that you are supposed to respond but, instead, offer guideposts for understanding your feelings and reactions. The first stage is that of fear, denial, numbness and shock. During this time, you are usually protecting yourself from experiencing the intensity of the loss and the uncertainty of the future. The next stage, known as bargaining, is marked by preoccupation with how the loss could have been prevented, or what the future might have been like if the loss had not occurred. The gray cloud of depression is also a phase in the grieving process. Your ability to sleep, eat or concentrate is usually affected. Feelings of loneliness, isolation and self-pity can also surface. Anger is another inevitable emotional response to feelings of powerlessness and resentment. Acceptance is when most of your feelings are resolved and you have arrived at a more positive outlook. Typically, people move between the phases of grieving over a period of months, sometimes finding themselves back in a phase they thought they had completed. On a physical level, your transformation means committing to a healthy lifestyle that includes a balanced diet, daily exercise and weight control. While these habits are important for anyone, they are particularly significant for bilateral amputees. Lack of activity and weight gain will severely limit your ability to become a full-time prosthesis user. Exercise and physical therapy result in a leaner, stronger and more flexible body. Your stamina increases, and when combined with a diet of fresh, healthy foods, your energy and vitality are restored. Transformation and the Graduated Approach Step 4 is truly the step of active transformation: You are ready to begin walking through life on full-length prostheses with microprocessor-controlled knees. Each part of the prosthesis plays a vital part in your mobility. The anatomically contoured sockets are the foundation of your comfort. The thin, flexible material allows for more feeling in the residual limb, giving you more control over the prostheses when walking. The computerized legs automatically adapt to the speed, length and frequency of each step. This is especially important when walking on slopes, uneven surfaces, curbs or stairs. Prosthetic users say that computerized legs give them a strong sense of stability and a natural gait. Energy-storing feet further enhance the gait. Some people begin Step 4 with the assistance of a cane, but most are walking independently after a few months. Time, teamwork and transformation are the guiding qualities of the graduated approach to becoming a bilateral above-knee prosthetic user. It is important to note that the people described in this article are reaching their goals because they use their prostheses all day, every day. They have learned through experience that walking on their prostheses a few hours a week at physical therapy is not enough. “Unfortunately, there is no shortcut and no magic pill,” says Heath. “At the very beginning of trying to walk, I’d go to physical therapy for a couple of hours a day, then get right back in my wheelchair and go about my business. This is not the way to become independent on a pair of prosthetic legs. Your prostheses must become a part of your daily life.” Another key factor in the success of these bilateral prosthesis users involves their habits at home. When not wearing their prostheses, they do not use a wheelchair to move around the house. Instead, they crawl, climb and use their upper body and residual limbs to get where they want to go. This type of movement burns calories, keeps the upper body toned, and strengthens the residual limbs. As your confidence as a prosthesis user grows, begin setting goals that challenge the stereotypes some have placed on amputees. Be inspired by those who break through barriers and pursue active lifestyles. Many bilateral amputees are driving vehicles without hand controls (some even choose manual transmissions), navigating airports without using a wheelchair, walking through shopping malls, and carrying their children. Push beyond negative advice about what you can and cannot do as an amputee or a prosthetic user. The only person who can define your life is you. Kevin Carroll, MS, CP, FAAOP, has been a practicing prosthetist for more than 30 years. He is the vice-president of prosthetics for Hanger Prosthetics & Orthotics in Bethesda, Maryland. He travels across the country consulting with and managing the treatment of amputees with complex cases. He also presents workshops on bilateral above-knee prosthetics and other specialized topics. He is chair of the Lower Extremity Prosthetic Society for the American Academy of Prosthetics & Orthotics. Randy Richardson, RPA, is a licensed prosthetic assistant and has been with Hanger Prosthetics & Orthotics for more than 15 years. He specializes in working with bilateral aboveknee prosthetic users to enable them to be more independent and functional with prostheses.